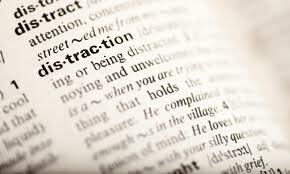 Distractions, distractions, distractions….they come in every size, shape and color! Those things or people that turn our eyes away from the purposes of God in our life. They even come in very “religious” packages! That’s why it is critical that those of us who follow Jesus keep our eyes focused on Him. Not the church, not the Pastor but on Him. He is to be our focus. When we place our focus on people or things we are sure to be disappointed at some point. When we keep our focus on Him, we are able to overcome any disappointment in people or things or situations. Jesus knows how easily distracted we can become by situations, people and things. The Word of God is full of admonishments to keep our eyes focused on the Lord and the calling He has put on our life. When we don’t it doesn’t take but a short time before we find ourselves operating on our feelings alone. We are not called to be people of feelings but rather people of FAITH! We never know when God will put a person in need in our prayer path and if we are not walking in intimacy with Him we may lose an opportunity to share the gospel or intercede for another that really needs to hear from God. In my walk, I find that when I take my eyes off of Christ, I begin to focus on the external and pretty soon my prayer life suffers. Doubt begins to take hold and I don’t come boldly before the throne as the Word of God tells us we can. Instead I pray weak prayers with weak faith. Thanks be to God that in His kindness and mercy, He will remind me once again that as I abide in Him and keep my eyes fixed on Him, I CAN come boldly before the throne and make my prayers known! I love that He doesn’t give up on us but draws us back with the gentle wooing of the Spirit. Colossians 3:1-4 NKJV 3 If then you were raised with Christ, seek those things which are above, where Christ is, sitting at the right hand of God. 2 Set your mind on things above, not on things on the earth. 3 For you died, and your life is hidden with Christ in God. 4 When Christ who is our life appears, then you also will appear with Him in glory. Romans 8:5 NKJV 5 For those who live according to the flesh set their minds on the things of the flesh, but those who live according to the Spirit, the things of the Spirit. Hebrews 12:1-2 NKJV 12 Therefore we also, since we are surrounded by so great a cloud of witnesses, let us lay aside every weight, and the sin which so easily ensnares us, and let us run with endurance the race that is set before us, 2 looking unto Jesus, the author and finisher of our faith, who for the joy that was set before Him endured the cross, despising the shame, and has sat down at the right hand of the throne of God. Psalm 119:1-7 NKJV 119 Blessed are the undefiled in the way, who walk in the law of the Lord! 2 Blessed are those who keep His testimonies, who seek Him with the whole heart! 3 They also do no iniquity; they walk in His ways.4 You have commanded us to keep Your precepts diligently .5 Oh, that my ways were directed to keep Your statutes! 6 Then I would not be ashamed, when I look into all Your commandments .7 I will praise You with uprightness of heart, when I learn Your righteous judgments. Following Christ is a daily walk. If we drop our focus even for a day, we lose opportunities we may never get back. We do however serve an awesome God who offers us new mercies every day! Lamentations 3:22-23 NKJV 22 Through the Lord’s mercies we are not consumed,because His compassions fail not. 23 They are new every morning; Great is Your faithfulness. So as you start each day remember it is never too late to set your eyes on Jesus and the calling He has for you! Thank Him for His mercy and faithfulness in never abandoning you no matter how much you mess up! He is an awesome loving Savior that longs for you to refocus and keep moving forward in your service to Him. Christian Poets & Writers will surely identify with this, Lorraine, so I highlighted your post on the Christian Poets & Writers blog – http://www.christianpoetsandwriters.com.